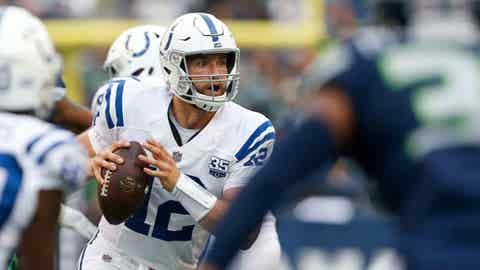 Luck was back under center, leading Indianapolis on a pair of field-goal drives in just over a quarter in the Colts’ 19-17 victory over the Seattle Seahawks on Thursday night. The reintroduction of Luck as the Colts’ leader started with a 17-yard swing pass to Marlon Mack on the first play. It concluded early in the second quarter when his pass intended for T.Y. Hilton was broken up. In between, Luck was bear-hugged by Seattle All-Pro linebacker Bobby Wagner on a scramble run and sacked by Rasheem Green, and he showed flashes his surgically repaired right shoulder is ready to allow him to again be a premier quarterback. Luck completed 6 of 9 passes for 64 yards, most of that coming on the opening drive, when he hit 5 of 7. Luck completed passes to five receivers and threw from a clean pocket on most of his drop-backs, even with starting left tackle Anthony Castonzo not playing. It had been nearly 600 days since Luck was last on the field, when he threw for 321 yards in a 24-20 win over Jacksonville on Jan. 1, 2017. For one night, Luck showed his pre-surgery form. Luck’s counterpart from the 2012 draft, Russell Wilson, played one series for Seattle. Wilson was 4 of 5 for 43 yards and capped his only drive with a 5-yard touchdown pass to tight end Nick Vannett. It was Wilson’s first action playing in the offense of new coordinator Brian Schottenheimer, which will be heavily tilted toward the run. Second-year running back Chris Carson averaged 6.5 yards per carry in limited action. Seattle’s defense scored with 3:15 left when an errant snap was recovered by Joey Ivie for a touchdown. Defensive linemen Branden Jackson and Quinton Jefferson and offensive lineman Duane Brown left the field following team introductions and before the start of the anthem. They returned to the sideline immediately after it concluded. All three were among a group of Seattle players who sat during the anthem last season. Seattle rookie linebacker Shaquem Griffin was all over the field in his debut. Griffin led Seattle with nine tackles, flashing the speed that made him a star in college. But he was also bullied on one play when Indianapolis tight end Jack Doyle used his size to create separation from Griffin on contact and caught a 9-yard pass from Luck. The most significant injury was Mack leaving late in the first quarter with a hamstring issue. Mack had four carries and two receptions in the first quarter. He wasn’t likely to get much more action but is still a concern going forward. Reich didn’t have any more of an update postgame. Seattle backup offensive tackle Isaiah Battle limped off the field with a sprained knee in the third quarter, but Seattle coach Pete Carroll said it didn’t appear severe. Battle had been gaining on Germain Ifedi for the starting right tackle spot. Rookie tackle Jamarco Jones also had to be carted off in the fourth quarter after injuring his left ankle. Carroll said X-rays were negative but that it was a significant sprain.